Adventures in Healthy Cooking - from our Kitchen to Yours! Whether or not you get to come cook with us at one of The Kids' Table's Chicago locations, we hope you'll follow our culinary adventures through this blog. We'll be sharing anything related to food and kids - like tips and tricks for enticing picky eaters, healthy school lunch ideas, time saving tactics in the kitchen, and of course, LOTS OF RECIPES! I'm so grateful for the amazing people who are part of The Kids' Table family - they are talented, always willing to roll up their sleeves, and believe whole-heartedly in our mission to teach folks of all ages that cooking is fun and real food is really good! One of these amazing people is Pam. She teaches classes (babies & tots are her favorite age groups), is our social media/marketing guru, and routinely whips up deliciously seasonal recipes with kids at farmers markets. I'll let her tell you all about her most recent market adventure. Take 'er away, Pam! When The Kids’ Table is invited to a farmers market, we set up a table with a hands-on cooking project that kids can do. The recipe always features as many market fresh ingredients as possible, and the kids get to eat their creations in the end! So I give kids a “taste” of what we do at The Kids’ Table, chat with parents – and of course, meet the farmers and snag some delicious fruits and veggies! Generally, the week before the market, Elena and I chat about what I’m likely to find at the market, and come up with a simple recipe idea that would be good to make with the kids. By mid July, the markets are brimming with so many wonderful fresh vegetables, fruits and herbs. The options are almost limitless! A couple weekends ago I was scheduled at Green City Market. We decided on a Greek-Inspired Orzo Salad. I arrived at the market extra early, since my shopping list was rather long (it included cukes, tomatoes, red onions, arugula and fresh herbs). I swung by our table to drop off my cooking supplies and set right back out to shop. My first stop was Growing Home – a wonderful program out of Englewood, Illinois that provides farm-based training for people with employment barriers. They grow food, then sell it at discounted prices to Englewood residents (to provide farm fresh access) and at competitive prices at markets throughout the city (to help support their programming). I found my fresh cucumbers there, as well as a great assortment of herbs (including basil, mint and parsley). Four ingredients I needed right off the bat - score! Next I headed over to Nichols Farm & Orchard – a perennial favorite for me. They are a 3rd generation family farm out of Marengo, Illinois, and always ready to offer advice on the best ingredients for whatever recipe I happen to be making. That day I’d hoped to buy red onions, but they weren’t ready for harvest yet. So the Nichols folks suggested a candy onion instead (which was as sweet as the name suggests!). I also picked up some delicious baby arugula – one of my favorite greens because of its spicy kick. Lastly, I needed to find the real star of this salad: tomatoes. I’m always so happy once the tomatoes have arrived at the markets – that means it’s officially summertime! For this recipe I wanted cherry tomatoes, so I turned to Iron Creek Farm, a certified organic farm out of La Porte, Indiana. This farm has been owned and operated by the Mark family for over 100 years! 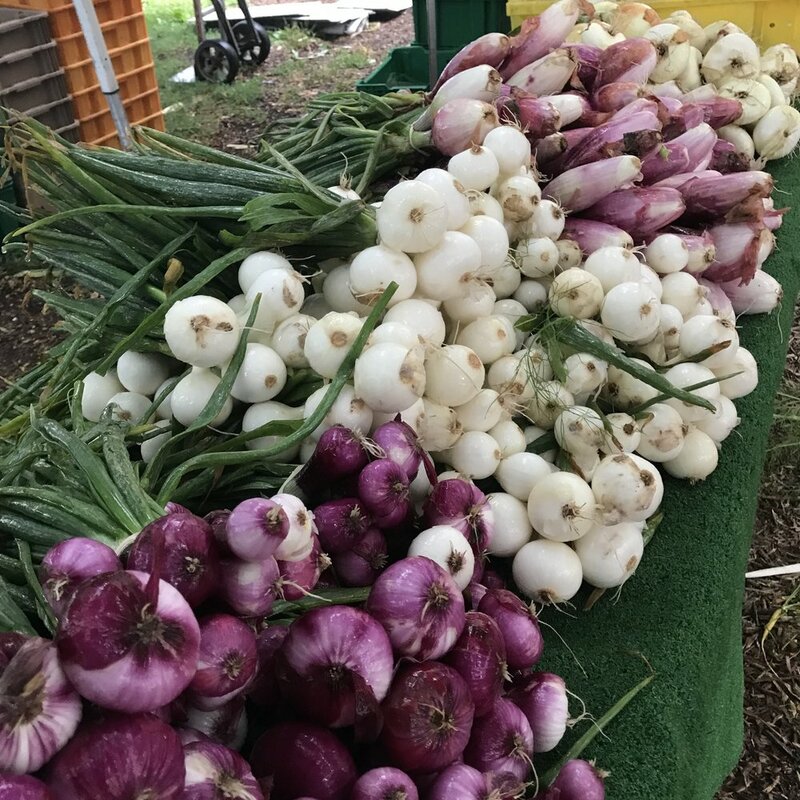 As the story goes – Patrick and Tamera Mark met at a Farmers Market when they set up their produce stands next to each other. The markets were not very busy so they had time to fall in love (and later get married). As they say, the rest is history…. Please enjoy this recipe! And come cook with me some time at the market." To make dressing, combine oil, lemon juice, vinegar, garlic, shallot, mustard, oregano, salt and pepper in a jar. Seal tightly and shake well to emulsify. Set dressing aside. In a large bowl, combine orzo, cucumber, tomatoes, onion, arugula and herbs. Add enough dressing to nicely coat (about 3-4 tablespoons). Toss well. Taste. If needed, add a little more dressing and/or salt and pepper (extra dressing will keep in the fridge for up to a week).